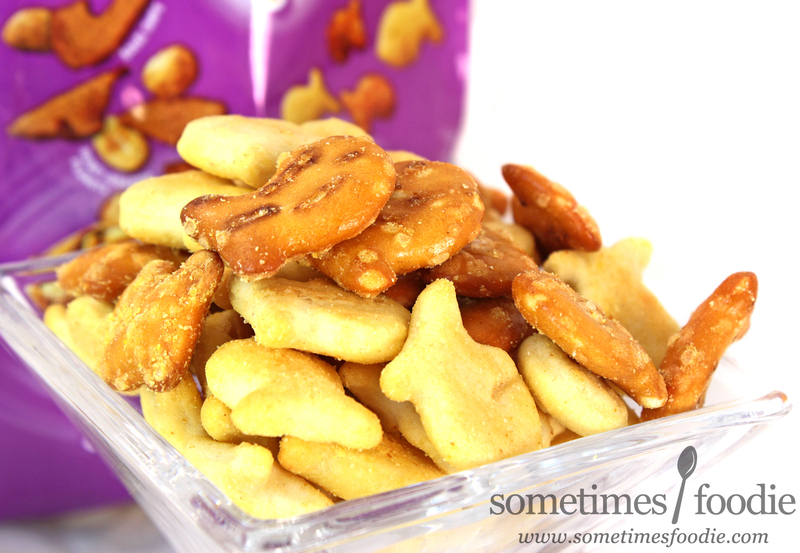 My little sister loved Goldfish crackers growing up, but I was more of a Cheez-it or Cheese Nip kind of girl. Honestly, I always felt like Goldfish were a blander, fish-shaped, version of the cheesy square-crackers I loved, and that they were meant for little kids, so I didn't really give them the time of day, until they started coming out with all of these new flavors. There's been cheeseburger flavored fish, vanilla cupcake, french toast, and even more mature cheese flavors. The list is ever growing. It's nice to see this company trying new things to keep up with all the other food products out there, and even though I was never a Goldfish fan, the foodie in me just couldn't resist the allure of these new fancy flavors. I've always had a thing for flavored pretzel pieces, like Snyders, so I figured, why not give this new cracker and pretzel flavor combination a try? Design-wise this bag is pretty okay, and the purple coloring stood out in a sea of blue and white cheesy cracker bags, but my critique today won't be on the overall design, it'll be on the functionality. 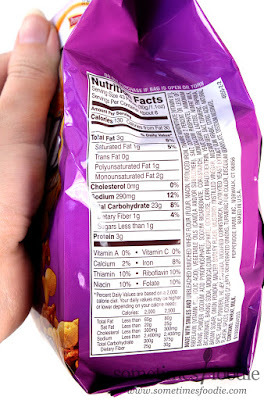 See that handy little "Open Here" note at the top of the bag? Pardon my French but F*CK THAT! I'm really hoping that I got a defective bag or something, because this was ridiculous. I followed the little prompt, carefully pulling the bag apart and separating that inner heat-sealed seam, and everything was going great, then that seam in the back holding the bag together came undone. Before I knew it, all my little fishies are escaping. What the hell? There's no way I'm taping this bag together, so after this review these fish are being transported into a ziplock bag. After photographing everything I tried playing around with the top seam to make sure I was't ripping my food bags open like the Hulk or something, and that seam was glued way stronger than the rest of the bag, even stronger than the seam in the back holding the back together. That just seems like a packaging fail to me, and I wanted to have my little rant about it to vent my foodie frustration. After I put away my dustpan and stopped cursing, like the classy lady that I am, I poured some of the remaining pretzels and crackers into a dish to get a closer look. They smell cracker-like and not mustard-y at all, but they look like they've been covered in some kind of yellow-tinted flavor dust, so maybe they taste stronger? I tried the classic Goldfish cracker first, which was a slightly yellowed beige color, and it tasted really mild. We're talking baby food level mild. The overall taste reminded me of those little bread sticks you find in Chex Mix, but with a less crunchy texture, and a very very mild honey mustard hint. I'm not sure if these cracker-fish are seasoned at all, or if they just picked up some residual flavoring from the more heavily seasoned pretzel fish. 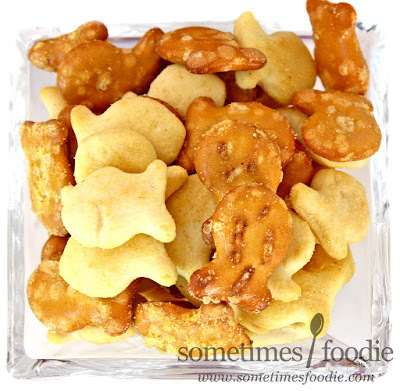 If you took normal, unflavored, Goldfish and added them to a bag of Snyder's flavored pretzel bits, shook them up, and separated them, those would taste more intensely mustardy than these little crackers. The pretzels look like they have more seasoning on them, so maybe those taste better? I grabbed a few pretzel fish at the same time to hopefully get a more intense flavoring this time around, and they were better, but still not great. The pretzel fish are definitely more seasoned, or maybe their texture and added salt just hold onto the flavoring better, but these are still really mild. If there were a toddler-finger-food version of Synder's honey mustard and onion pretzel pieces, this would be it. 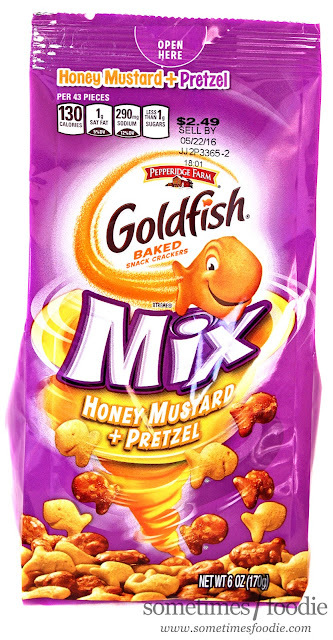 The pretzel fish have a really nice and light pretzel texture, that I like a lot more than the cracker-style fish in this mix, but the flavor pay off just isn't there. These are not a bad snack, and I'll easily polish this bag off at my work desk this week, but it's really mild compared to what I'm used to. If I want honey mustard pretzel pieces, I'll stick with my tried and true brand, Snyders, which are pretty much the same price, and you get more flavoring for your money. These little fish might be good if you have little kids, or toddlers who are teething or something, but they're just too weak for me and I won't be buying them again.